These were healthy looking bare root plants but needed better labels. There were a lot of different roots but not all were labelled and it appeared that I got a double order of these plants but I wasn't sure. I tossed the extra roots in a separate hole in the ground so I'll have to wait and see what comes out! A very natural appearance when grown and lovely blooms! Ordered package of 5 plants. Have planted these and they seem to be doing great! Got my plants they were packaged good but they seemed a little dry. Planted them now we will see the results. Indian pink flowers bring a dramatic flavor to almost any garden. The flower may have “pink” in its name. However, their blooms are very strikingly red with the canary yellow lobe. However, the flower turns completely green in the autumn. They seem to be a favorite of hummingbirds, bees, and butterflies alike. They tend to bloom during the beginning of summer in June, and they do so year-round in clumps for up to two years. It is said to do quite well in gardens. Indian Pink Plants can also be prolonged by removing them as they wither. Another thing that makes it stand out as a perennial flower is that its bulb remains at the bottom of the trumpet-shaped yellow throat. It also has the green leafy foliage immediately surrounding it. The foliage stays green all year round. No other known flower has such a unique feature. Indian Pink Plantsgets its name partially from the fact that Native Americans used it medicinally for a cough and tapeworm remedies. It is also deer and rabbit resistant. Indian Pink plants help with maintaining focus and also helps with having the ability to coordinate activities even if under a lot of stress at the time. This plant can be created from a lovely essence oil and is very popular to create health and harmony when one is under a lot of stress from certain situations in our lives. 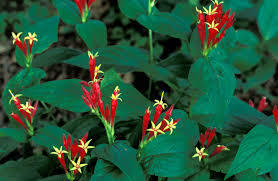 Indian Pink Plants is a loved vine with emerald green foliage. This plant is perennial and regrows every year brings new blooms every year. The blooms of the plant are pink in color but have a darker complexion towards the center of the bloom, colored like a rose. This is a slow grower and will not be able to compete with weeds and aggressive plants that may out-compete with it for resources. Indian Pink grows best in moist areas and prefers shade to live. Indian Pink Plant prefers rich soil but can adapt to many soils.